I had a great time at the Teen Book Fest last Saturday. All five of the authors spoke about their books, about how they came to be writers and how they managed to be published. The teens asked a lot of good questions. They asked about whether people compared the authors to Stephanie Meyer and whether they were envious of her success. They started a discussion of self-publishing. At the end of the presentation, authors signed their books. I had my copies of Radiance by Alyson Noel that we earned at the book fair, and Noel signed those. I also bought more books in the Nightshade High series by Marlene Perez. 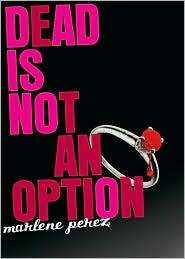 In fact, I was able to buy the fifth book in the series, Dead is Not an Option, even though the release date isn’t until May 2. And, after hearing all the authors speak, I realized that I need to read Bad Girls Don’t Die by Katie Alender. This entry was posted in Fiction, Hi-Low/Quick Read, Horror/Mystery/Suspense, Supernatural, Young Adult Literature and tagged creative writing, writing instruction. Bookmark the permalink.